Oh, I had fun making this! She’s now three years old. It has been one of my favorite projects. I have a huge display this year and she still holds her own, even with our 12 foot ghost and witch circle (you can get those instructions here)! Yep. Look at this and make it out of string is all I’ve got for the web! Like a lot of things in Hobby Lobby: most of the dress forms were broken. We had to find some up on shelves. 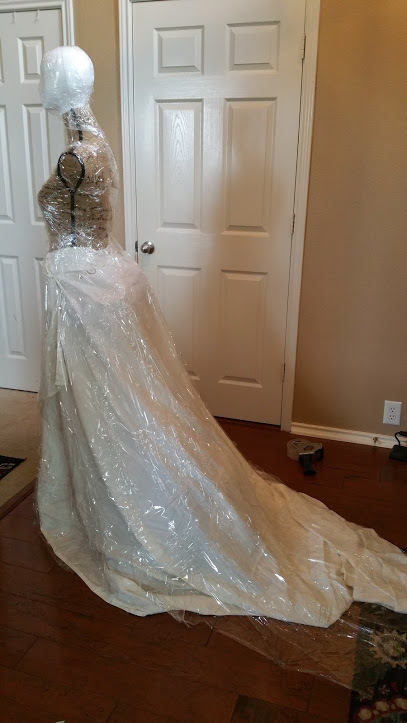 So if you are going to try this and want to buy the dress form: make sure what you are getting is solid, if it isn’t make sure you talk to the manager and get a discount. (Hobby Lobby will give you incredible deals on things that are slightly damaged. Our local Micheal’s craft store does not have these. I did not try JoAnn’s fabric.) I would guess that this type of mannequin is sold in many different hobby/craft/fabric stores, you are just going to have to look around. Why a form is a really big plus: Your ghost will look really polished, but more importantly you can put it back on the form to stretch it back out if you are dumb like me and just throw her in your garage at the end of the year. 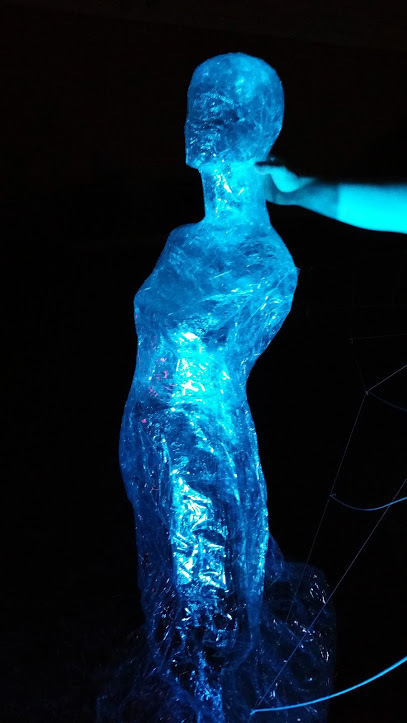 She turned into a big unformed ball of packing tape in our 100+ degree summers. Live and learn. Take good care of your projects if you don’t want to remake them every year! 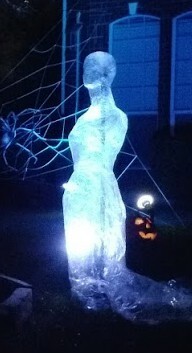 Our Ghost looks great on her pvc and rebar support! To secure it: I suggest getting some landscape pins from a home and garden store. You don’t want this to fall or blow away. We had no time to work on her support the first year so my husband just took the ghost and put her on a large floor lamp with the shade removed. It wasn’t quite tall enough so the skirt buckled (not permanently, but she looks so much more impressive set up at the right height.) More importantly: ours blew over! We got home to find the tape had touched the light we had aimed at her…and it was smoking. We were very lucky the ghost didn’t catch fire in the front yard! We bought a battery powered strobe light this year. It fits inside the skirt and doesn’t get hot! I’d love to see your versions and please remember to include where you got your instructions if you share your creation! I want to send a big thank you out to everyone who has visited this page! I have had over 10,000 views just in October 2017! If you are interested in making any of my projects here the links are below the photos! We definitely went big this year! 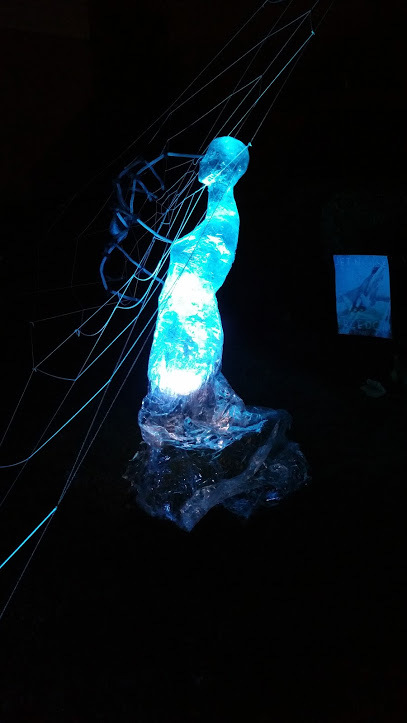 If you enjoyed my packing tape ghost, here’s my second most visited post! Learn about the heat island effect in suburban and urban home sites! Please don’t rock your yard! My latest post is how to make healthy school lunches from home, and with a little trick, I bet your kids will eat it like mine do, everyday! And if you would like to get to know my heart, try: a love letter to my boys! Or get into the reason I started this blog! A beginner’s guide to gardening. This is so cool. Thank you for the info on how the tape can’t get hot. That would be an unpleasant surprise inside the house. Outside sounds good. Good instructions. Now I have a second excuse to get that dress form I’ve been wanting. 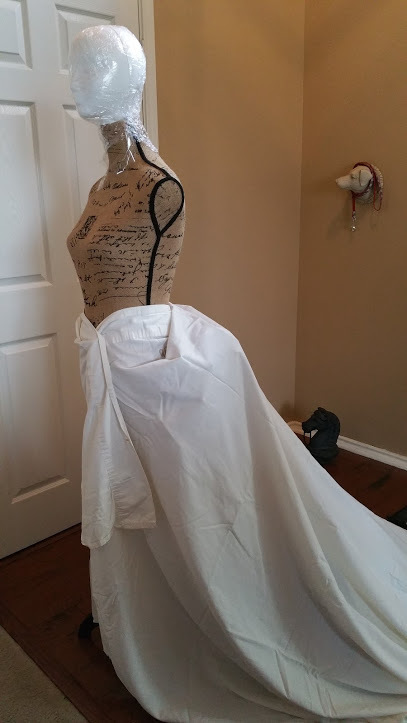 Once you have the dress form you can make more every year. I plan on having a whole yard full of ghosts. Since we’re so far south I decided to store her inside the house in our spare room. I think the heat of summer would do a lot of damage to the adhesive and the tape. Farther north: the winters would affect it. It’s been my experience that tape on stored packing boxes loses its integrity over the years. I want to keep this as long as possible! Thanks for coming by! I appreciate the visit! Hi. 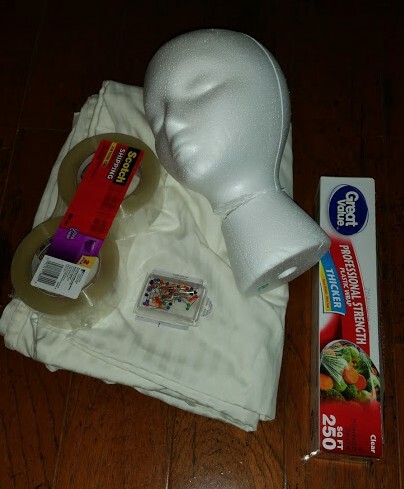 I love this ghost idea and I’m going to give it try this year. 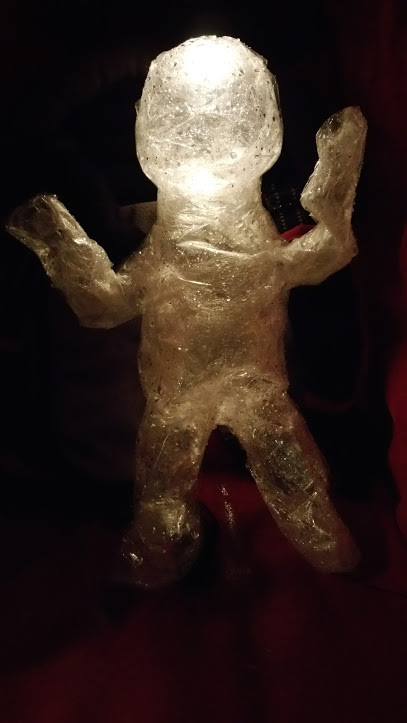 A suggestion for keeping the tape and plastic away from the light is to put chicken wire or something around the light to keep it from melting your creations. Great job and love your directions! 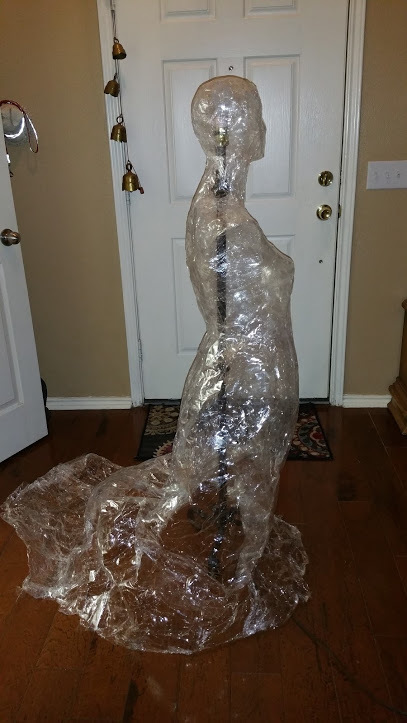 I definitely agree that the plastic wrap is an awesome idea!!! Happy almost Halloween! I stuffed a long sleeved shirt and jeans with newspaper. I used an old pair of sneakers and a styrofoam head. Then I cut open black trash bags and wrapped the “body” and duct taped it all together. I wrapped a rope around it to stabilize it all and threw it up into our tree and tied it. It’s really cool during the day but invisible at night. I’d use white trash bags next time or I may train an outdoor light on it. The other problem is that the body is stuffed with newspaper and gets damp and loses shape. It was the first decoration I made for our yard and I no longer use anything that will get ruined with water, like cardboard or newspaper. It’s better to stuff things with plastic bags or bubble wrap. It looks pretty realistic, though, and I haven’t made time to make any major changes to it. But I have had to open it up and run duct tape through the legs and over the shoulders to keep it together after our sprinklers hit it one year and it unraveled, with half on the ground and half in the tree! I think it’s 4 years old now. I’m glad you stopped by! Thanks for the question.